LDS | Mainline Conveyor Systems, Inc. 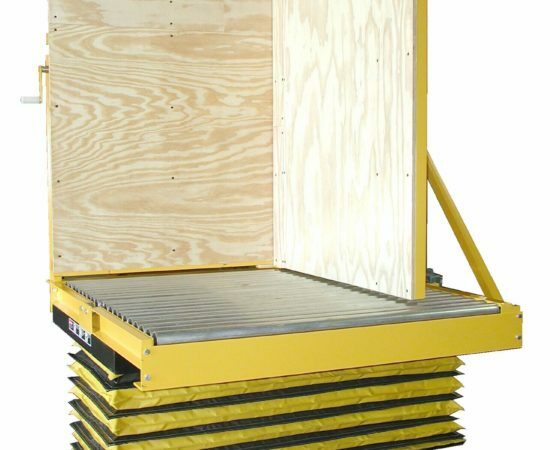 The “Easy Stack” is a manually operated self contained, load stacking aid. This device includes fixed and adjustable backstops that create a stacking corner for manually stacking bundles into unit loads. The adjustable backstop is mounted to the fixed backstop and is adjustable through the full width of the conveyor. Adjustment of the backstop may be performed by turning a hand crank located on the operator side of the device. The fixed backstop is mounted directly to one end of the conveyor. The conveyor itself is CDLR (2-1/2″ dia rollers on 3″ centers), and is driven by an electric gearmotor. The conveyor drive is located behind the adjustable backstop, opposite the operator side of the conveyor, and powers the conveyor at a nominal speed of 45 fpm. The conveyor and attached backstops are all mounted to a hydraulic scissors lift, that raises the stacking platform from 12″ TOR to 48″ TOR.